Home » new Shade Sheist music , Shade Sheist where I wanna be » Shade Sheist "CPT LBC ING"
Shade Sheist "CPT LBC ING"
Yes, Yes, Y'all. 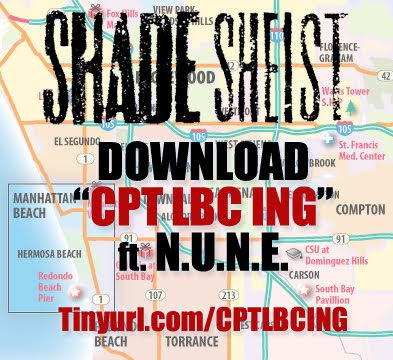 The one and only Shade Sheist is back with his new track "CPT LBC ING". Respect, brotha. Thanks for sending this my way. And you KNOW I had to post this video, man. This was my JAM. [R.I.P. Nate Dogg]. Jarren Benton "Freebasing with Kevin Bacon"
Dom Kennedy "The Yellow Album"
Steph Castro x Ike Da Kid "Over & Over"
RAtheMC "The Grace Jones Experiment"